I am officially addicted to watching the Olympics. Any time, any sport…if the Olympics are on my television, I am watching. The athletes have trained so hard and have accomplished much to earn the right to compete. Just being there must be a thrill for them, and then there are those who win medals. Isn’t it great to see that look of amazement and joy when an athlete realizes that he or she has won? I enjoy those moments especially. Needless to say, I have been a little more tired since the Olympics started because watching them takes a lot of endurance. Once I sit down after dinner and tune in, I am there for the long haul. SensitiveHusband and I have been staying up later than usual since coverage continues until the wee hours. If synchronized Olympics watching were a sport, I think SensitiveHusband and I could medal! In this week’s farm share we received a lot of eggplant. One was white and egg-shaped (aha! so that is how it gets its name! ), one was large and dark purple (the kind I am used to seeing), and three were long and light purple (I thought at first that they were peppers). Some Internet research showed that we had one white, three Chinese, and one Italian eggplant. There are a number of varieties – the Cook’s Thesaurus has a good reference of pictures. According to Peggy Trowbridge Filippone, The eggplant is considered a vegetable but is botanically a fruit. Botanists assume India as the motherland of the eggplant, but Asian countries were using the fruit vegetable in the kitchen around 3 A.D. By 11 A.D. it reached Europe, where consumption of the eggplant was at first thought to cause insanity. Thomas Jefferson brought the eggplant to the U.S. where it was mostly used as a table ornament until the 20th century. According to the Agricultural Marketing Resource Center at Iowa State University, Georgia, Florida, California, New Jersey and New York were the top five producers of eggplant in the U.S. World production of eggplant is highly concentrated, with 83% of output coming from China and India. U.S. eggplant consumption has increased over the past five decades. Between 2005-2010, per person use of eggplant was 0.9 pound. This recipe for Roasted Eggplant with Olive Oil and Lemon accommodated all of our varieties of eggplant, and the instructions looked easy, leaving me more time to watch synchronized diving followed by gymnastics. I thought the recipe as is deserved a gold medal, yet SensitiveHusband thought it needed a bit more flavor. Our revised recipe below adds a bit more olive oil and lemon juice for an award-winning side dish. Preheat the oven to 400 degrees F. Line a baking sheet with parchment paper or lightly grease. 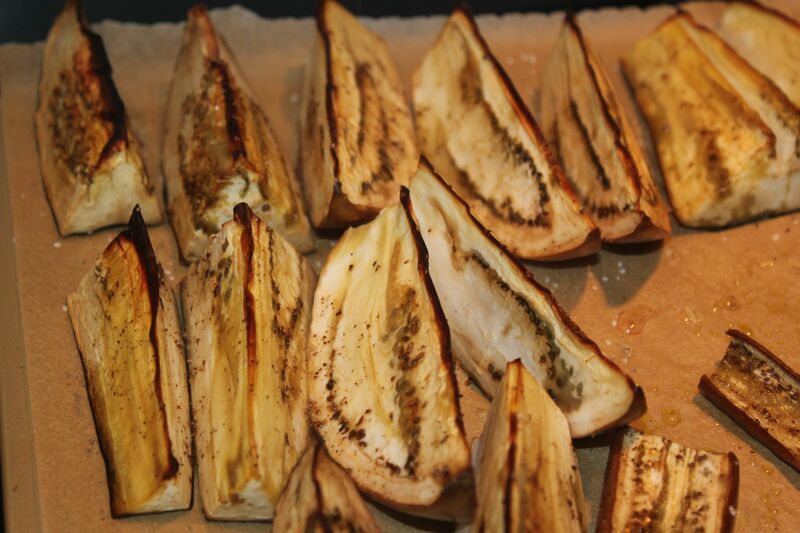 Slice the eggplant in half lengthwise, then cut each half into quarters lengthwise. Cut each in half to make two shorter quarters. Place the eggplant onto the baking sheet with the skin side down. Brush each piece with olive oil and season with salt and pepper. Roast until golden brown, 25 to 30 minutes. Remove from oven and sprinkle with lemon juice. Serve hot. I am sharing this recipe with In Her Chucks, Simply Sugar and Gluten Free, Gastronomical Sovereignty, Food Trip Friday and Miz Helen’s Country Cottage. This entry was posted in Economics, Recipes - Vegetables and tagged Cane sugar free, eggplant, farm share, lemon, Yeast free. Bookmark the permalink. 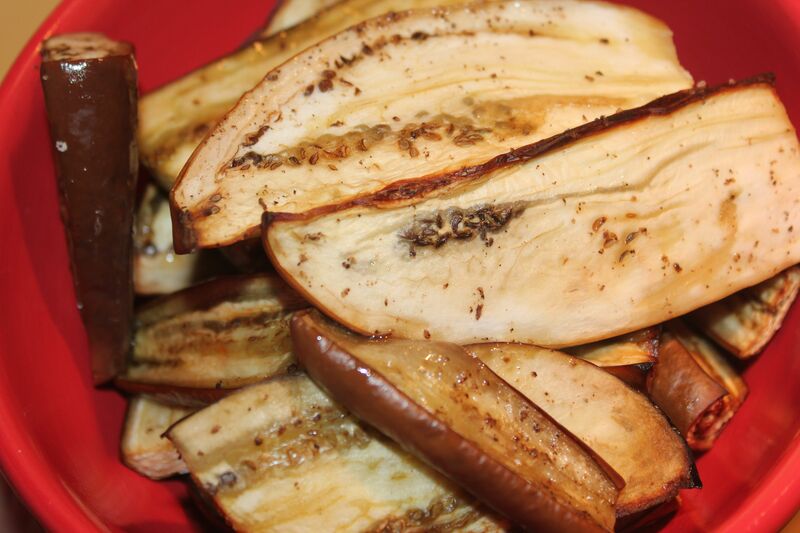 I LOVE my veggies roasted…but I have never tried roasted eggplant! Thanks for sharing and inspiring me to give it a shot. Thanks for your comment and for the invite to your site. I just shared this recipe. Have a good day! This looks so simple! I often avoid making eggplant regularly because it has to “sweat” – love how this recipe cuts out that step! i adore the cooksthesaurus! it can be so handy sometimes! haha and good on you for taking the time to figure out what you got in your CSA! it can be daunting sometimes when you receive something and you don’t really know what it is. but once you find out, it’s such an adventure! We learned so much by cooking all of the types of eggplant. It’s fun to learn about the seasonal produce! p.s. i’ve tried to find an email address for you darling but i can’t! i’m featuring your post this week on the blog hop via Gastronomical Sovereignty – and i have a button for you! if you wanna throw me an email i’ll send it to you! xo! This is wonderful news! Thank you for featuring my recipe!